"Anchorage" redirects here. For other uses, see Anchorage (disambiguation). Anchorage skyline and Bootleggers Cove as photographed from Point Woronzof Park on an April evening. 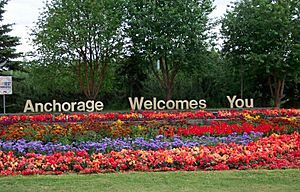 Nickname(s): "The City of Lights and Flowers", "Los Anchorage"
Anchorage (officially called the Municipality of Anchorage) (Dena'ina Athabascan: Dgheyaytnu) is a unified home rule municipality in the U.S. state of Alaska. With an estimated 299,037 residents in 2016, it is Alaska's most populous city and contains more than 40 percent of the state's total population; among the 50 states, only New York has a higher percentage of residents who live in its most populous city. All together, the Anchorage metropolitan area, which combines Anchorage with the neighboring Matanuska-Susitna Borough, had a population of 401,635 in 2016. Due to its location on the globe, being almost equidistant from New York City, Tokyo, and Berlin, Anchorage lies within 9 ½ hours by air to nearly 90% of the industrialized world. For this reason, the Anchorage International Airport is a common refueling stop for many international flights and is home to a major FedEx Hub which the company calls a "critical part" of its global network of services. 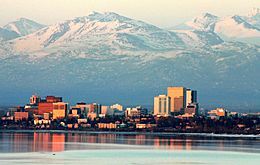 Anchorage has been named an All-America City four times, in 1956, 1965, 1984–85, and 2002, by the National Civic League. It has also been named by Kiplinger as the most tax-friendly city in the United States. Russian presence in south central Alaska was well established in the 19th century. In 1867, U. S. Secretary of State William H. Seward brokered a deal to purchase Alaska from Imperial Russia for $7.2 million (about two cents an acre). His political rivals lampooned the deal as "Seward's folly", "Seward's icebox" and "Walrussia". By 1888, gold was discovered along Turnagain Arm. 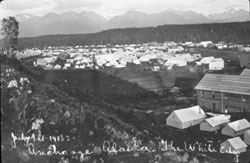 The tent city (called "The White City" in the handwritten caption) in Ship Creek, photographed by Alberta Pyatt on July 1, 1915. Alaska became a United States territory in 1912. Anchorage, unlike every other large town in Alaska south of the Brooks Range, was neither a fishing nor mining camp. The area surrounding Anchorage lacks significant economic metal minerals. A number of Dena'ina settlements existed along Knik Arm for years. By 1911 the families of J. D. "Bud" Whitney and Jim St. Clair lived at the mouth of Ship Creek and were joined there by a young forest ranger. Jack Brown, and his bride, Nellie, in 1912 to have lived in the Ship Creek valley in the 1910s prior to the large influx of settlers. The city grew from its happenstance choice as the site, in 1914, under the direction of Frederick Mears, of a railroad-construction port for the Alaska Engineering Commission. The area near the mouth of Ship Creek, where the railroad headquarters was located, quickly became a tent city. A town site was mapped out on higher ground to the south of the tent city, greatly noted in the years since for its order and rigidity compared with other Alaska town sites. In 1915, territorial governor John Franklin Alexander Strong encouraged residents to change the city's name to one that had "more significance and local associations". In the summer of that year, residents held a vote to change the city's name; a plurality of residents favored changing the city's name to "Alaska City". However, the territorial government ultimately declined to change the city's name. 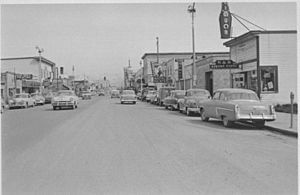 Anchorage was incorporated on November 23, 1920. Construction of the Alaska Railroad continued until its completion in 1923. The city's economy in the 1920s and 1930s centered on the railroad. Col. Otto F. Ohlson, the Swedish-born general manager of the railroad for nearly two decades, became a symbol of residents' contempt due to the firm control he maintained over the railroad's affairs, which by extension became control over economic and other aspects of life in Alaska. Fourth Avenue in 1953, looking east from near I Street. Just ten years before, the retail area shown in the foreground was mostly an industrial area, housing lumber yards and similar uses. Between the 1930s and the 1950s, the city experienced massive growth as air transportation and the military became increasingly important. Aviation operations in Anchorage commenced along the firebreak south of town (today's Delaney Park Strip), which residents also used as a golf course. An increase in air traffic led to clearing of a site directly east of town site boundaries starting in 1929; this became Merrill Field, which served as Anchorage's primary airport during the 1930s and 1940s, until Anchorage International Airport replaced it in 1951. However, Merrill Field still sees a significant amount of general aviation traffic. Elmendorf Air Force Base and Fort Richardson were constructed in the 1940s, and served as the city's primary economic engine until the 1968 Prudhoe Bay discovery shifted the thrust of the economy toward the oil industry. The 2005 Base Realignment and Closure process led to the combining of the two bases (along with Kulis Air National Guard Base) to form Joint Base Elmendorf-Richardson. The Good Friday or Great Alaskan earthquake on March 27, 1964. View of Fourth Avenue. 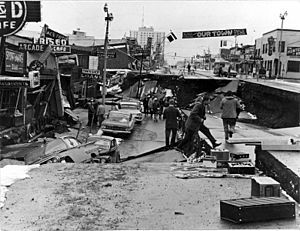 On March 27, 1964 the magnitude 9.2 Good Friday earthquake hit Anchorage, killing 115 people and causing $311 million ($2.14 billion current value) in damage. The earth-shaking event lasted nearly five minutes; most structures that failed remained intact for the first few minutes, then failed with repeated flexing. It was the world's second-largest earthquake in recorded history. Rebuilding dominated the remainder of the 1960s. In 1968 ARCO discovered oil in Prudhoe Bay on the Alaska North Slope, and the resulting oil boom spurred further growth in Anchorage. 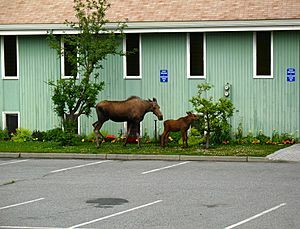 In 1975, the City of Anchorage and the Greater Anchorage Area Borough (which includes Eagle River, Girdwood, Glen Alps, and several other communities) merged into the geographically larger Municipality of Anchorage The city continued to grow in the 1980s, and capital projects and an aggressive beautification campaign took place. Several attempts have been made to move Alaska's state capital from Juneau to Anchorage – or to a site closer to Anchorage. The motivation is straightforward: the "railbelt" between Anchorage and Fairbanks contains the majority of the state's population. Robert Atwood, owner of the Anchorage Times and a tireless booster for the city, championed the move. Alaskans rejected attempts to move the capital in 1960 and 1962, but in 1974, as Alaska's center of population moved away from Southeast Alaska and to the railbelt, voters approved the move. Communities such as Fairbanks and much of rural Alaska opposed moving the capital to Anchorage for fear of concentrating more power in the state's largest city. 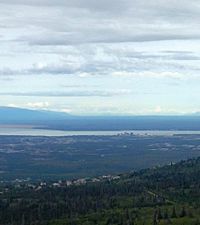 As a result, in 1976 voters approved a plan to build a new capital city near Willow, about 70 miles (110 km) north of Anchorage. Opponents to the move reacted by campaigning to defeat, in the 1978 elections, a nearly $1 billion bond issue to fund construction of the new capitol building and related facilities. Subsequent attempts to move the capital or the legislature to Wasilla, north of Anchorage, also failed. Anchorage contains over twice as many state employees as Juneau, and is to a considerable extent the center of state and federal government activity in Alaska. Satellite view of the "Anchorage bowl", also including Fire Island, Joint Base Elmendorf-Richardson and Eagle River. Anchorage is located in Southcentral Alaska. At 61 degrees north, it lies slightly farther north than Oslo, Stockholm, Helsinki and Saint Petersburg, but not as far north as Reykjavík or Murmansk. It is northeast of the Alaska Peninsula, Kodiak Island, and Cook Inlet, due north of the Kenai Peninsula, northwest of Prince William Sound and the Alaska Panhandle, and nearly due south of Denali. 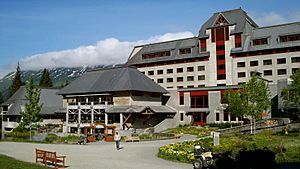 The city is on a strip of coastal lowland and extends up the lower alpine slopes of the Chugach Mountains. 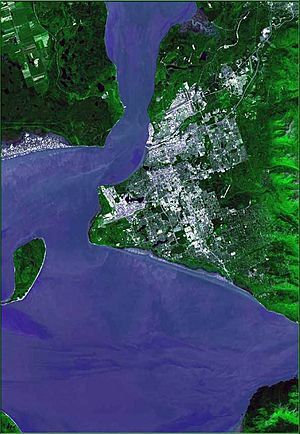 Point Campbell, the westernmost point of Anchorage on the mainland, juts out into Cook Inlet near its northern end, at which point it splits into two arms. To the south is Turnagain Arm, a fjord that has some of the world's highest tides. Knik Arm, another tidal inlet, lies to the west and north. The Chugach Mountains on the east form a boundary to development, but not to the city limits, which encompass part of the wild alpine territory of Chugach State Park. The city's sea coast consists mostly of treacherous mudflats. Newcomers and tourists are warned not to walk in this area because of extreme tidal changes and the very fine glacial silt. Unwary victims have walked onto the solid seeming silt revealed when the tide is out and have become stuck in the mud. The two recorded instances of this occurred in 1961 and 1988. According to the United States Census Bureau, the municipality has a total area of 1,961.1 square miles (5,079.2 km2); 1,697.2 square miles (4,395.8 km2) of which is land and 263.9 square miles (683.4 km2) of it is water. The total area is 13.46% water. Boroughs and census areas adjacent to the Municipality of Anchorage are Matanuska-Susitna Borough to the north, Kenai Peninsula Borough to the south and Valdez-Cordova Census Area to the east. The Chugach National Forest, a national protected area, extends into the southern part of the municipality, near Girdwood and Portage. Panorama of Anchorage as viewed at night from the Glen Alps neighborhood, near Flattop Mountain. The USS Anchorage departing from its eponymous port in May 2013. The vessel is framed by the city's downtown and the Chugach Mountain Range in the background. Panorama of Cook Inlet near the mouth of Turnagain Arm, a few miles south of the "Anchorage bowl." The tide is out, exposing the surrounding mudflats. 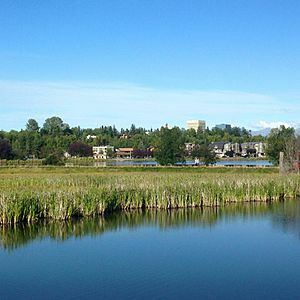 A diverse wildlife population exists within urban Anchorage and the surrounding area. Approximately 250 black bears and 60 grizzly bears live in the area. Bears are regularly sighted within the city. Moose are also a common sight: in the Anchorage Bowl, there is a summer population of approximately 250 moose, increasing to as many as 1000 during the winter. They are a hazard to drivers, with over 100 moose killed by cars each year. Two people were stomped to death, in 1993 and 1995, in Anchorage. Cross-country skiers and dog mushers using city trails have been charged by moose on numerous occasions; the Alaska Department of Fish and Game has to kill some individual aggressive moose in the city every year. Mountain goats can be commonly sighted along the Seward Highway between Anchorage and Girdwood, and Dall sheep are often viewed quite close to the road at Windy Point. Approximately thirty northern timber wolves reside in the Anchorage area. In 2007 several dogs were killed by timber wolves while on walks with their owners. There are also beaver dams in local creeks and lakes, and it is common to see foxes and kits in parking lots close to wooded areas in the spring. Along the Seward Highway headed toward Kenai, there are common sightings of beluga whales in the Turnagain Arm. Lynxes are occasionally sighted in Anchorage as well. Within the Municipality there are also a number of streams that host salmon runs. Fishing for salmon at Ship Creek next to downtown is popular in the summer. 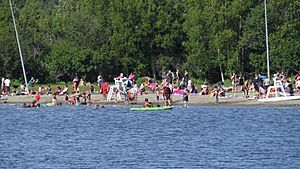 An early summer day at Jewel Lake Park in western Anchorage, Alaska. Anchorage as viewed from the Glenn Alps trailhead during the summer. Anchorage as viewed from Glen Alps trailhead during 0 °F (−18 °C) weather in the winter. Anchorage has a subarctic climate (the Köppen climate classification is Dfc) but with strong maritime influences that lead to a relatively moderate climate. Most of its precipitation falls in late summer. Average daytime summer temperatures range from approximately 55 to 78 °F (13 to 26 °C); average daytime winter temperatures are about 5 to 30 °F (−15.0 to −1.1 °C). 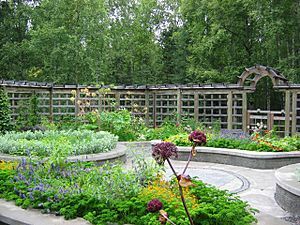 Anchorage has a frost-free growing season that averages slightly over 101 days. According to local folklore, when a native plant called fireweed fully blooms then goes to seed, the first snowfall of winter is 6 weeks away. Average January low and high temperatures at Ted Stevens Anchorage International Airport (ANC) are 11 to 23 °F (−12 to −5 °C) with an average winter snowfall of 75.5 inches (192 cm). The 2011–2012 winter had 134.5 in (341.6 cm), which made it the snowiest winter on record, topping the 1954–1955 winter with 132.8 in (337.3 cm). The coldest temperature ever recorded at the original weather station located at Merrill Field on the East end of 5th Avenue was −38 °F (−38.9 °C) on February 3, 1947. Summers are typically mild (although cool compared to the contiguous US and even interior Alaska), and it can rain frequently, although not abundantly. Average July low and high temperatures are 52 to 66 °F (11 to 19 °C) and the highest reading ever recorded was 87 °F (30.6 °C) on June 18, 2013. The average annual precipitation at the airport is 16.63 inches (422 mm). Anchorage's latitude causes summer days to be very long and winter daylight hours to be very short. The city is often cloudy during the winter, which further decreases the amount of sunlight experienced by residents. Due to its proximity to active volcanoes, ash hazards are a significant, though infrequent, occurrence. The most recent notable volcanic activity centered on the multiple eruptions of Mount Redoubt during March–April 2009, resulting in a 25,000-foot (7,600 m) high ash cloud as well as ash accumulation throughout the Cook Inlet region. Previously, the most active recent event was an August 1992 eruption of Mount Spurr, which is located 78 miles (126 km) west of the city. The eruption deposited about 3 mm (0.1 in) of volcanic ash on the city. The clean-up of ash resulted in excessive demands for water and caused major problems for the Anchorage Water and Wastewater Utility. The "Anchorage Welcomes You" sign located outside Ted Stevens Anchorage International Airport. The city is known for showcasing abundant flowers during the summer months. View from the Tony Knowles Coastal Trail near the mouth of Chester Creek. From foreground to background: Westchester Lagoon, the southern reaches of the Bootleggers Cove neighborhood, and the downtown skyline. According to the 2010 census, the largest national ancestry groups were as follows: 17.3% German, 10.8% Irish, 9.1% English, 6.9% Scandinavian (3.6% Norwegian, 2.2% Swedish, 0.6% Danish) and 5.6% French/French Canadian ancestry. According to the 2010 American Community Survey, approximately 82.3% of residents over the age of five spoke only English at home. Spanish was spoken by 3.8% of the population; speakers of other Indo-European languages made up 3.0% of the population; those who spoke Asian and Pacific Islander languages at home were 9.1%; and speakers of other languages made up 1.8%. In 2010, there were 291,826 people, 107,332 households and 70,544 families residing in the municipality. The population density was 171.2 per square mile (59.2/km2). 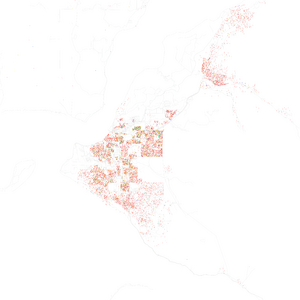 There were 113,032 housing units at an average density of 59.1 per square miles (22.8/km2). There were 107,332 households out of which 33.2% had children under the age of 18 living with them, 48.4% were married couples living together, 11.7% had a female householder with no husband present, 5.6% had a male householder with no wife present, and 34.3% were non-families. 24.9% of all households were made up of individuals and 4.9% had someone living alone who was 65 years of age or older. The average household size was 2.64 and the average family size was 3.19. The age distribution was 26.0% under 18, 11.2% from 18 to 24, 29.0% from 25 to 44, 26.6% from 45 to 64, and 7.2% who were 65 or older. The median age was 32.9 years. 50.8% of the population was male and 49.2% were female. The median income for a household in the municipality was $73,004, and the median income for a family was $85,829. The per capita income for the municipality was $34,678. About 5.1% of families and 7.9% of the population were below the poverty line. Of the city's population over the age of 25, 33.7% held a bachelor's degree or higher, and 92.1% had a high school diploma or equivalent. As of September 7, 2006, 94 languages were spoken by students in the Anchorage School District. In 2010, 83.7% (220,304) of Anchorage residents aged five and older spoke only English at home, while 4.47% (11,769) spoke Spanish, 2.53% (6,654) Tagalog, 1.56% (4,108) various Pacific Island languages, 1.38% (3,636) various Native American/Alaska Native languages, 1.14% (2,994) Korean, 0.63% (1,646) German, 0.57% (1,502) Hmong, 0.50% (1,307) Russian, and Japanese was spoken as a main language by 0.45% (1,185) of the population over the age of five. In total, 16.33% (43,010) of Anchorage's population aged five and older spoke a mother language other than English. 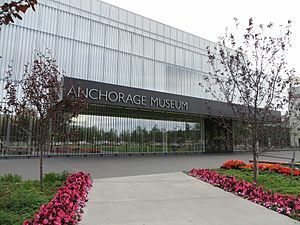 The front entrance of the Anchorage Museum at Rasmuson Center in downtown Anchorage, Alaska. 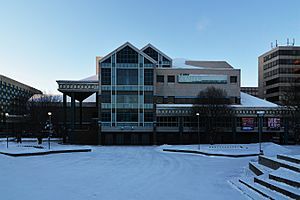 Located next to Town Square Park in downtown Anchorage, the Alaska Center for the Performing Arts is a three-part complex, hosting numerous performing arts events each year. The facility can accommodate more than 3,000 persons. In 2000, nearly 245,000 people visited 678 public performances. It is home to eight resident performing arts companies and has featured mega-musicals performed by visiting companies. The center also hosts the International Ice Carving Competition as part of the Fur Rendezvous festival in February. The Anchorage Concert Association brings 20 to 30 events to the community each year, including Broadway shows like Disney's The Lion King, Les Misérables, Mamma Mia!, The Phantom of The Opera, West Side Story, and others. The Sitka Summer Music Festival presents an "Autumn Classics" festival of chamber music for two weeks each September on the campus of Alaska Pacific University. Orchestras include the Anchorage Symphony Orchestra and the Anchorage Youth Symphony. Annually in January, the Anchorage Folk Festival takes place at the University of Alaska Anchorage, featuring concerts, dances, and workshops with featured guest artists and over 130 performances by volunteer singers, dancers, musicians, and storytellers. The city of Anchorage currently provides three municipal facilities large enough to hold major events such as concerts, trade shows and conventions. Downtown facilities include the Alaska Center for the Performing Arts, William A. Egan Civic & Convention Center and the recently completed Dena’ina Civic and Convention Center, which will eventually be connected via skybridge to form the Anchorage Civic & Convention District. The Sullivan Arena hosts sporting events as well concerts and annual trade shows. 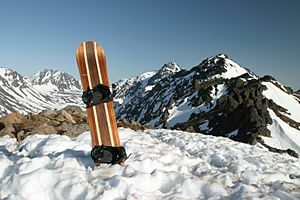 Peak Three in the Chugach Mountains. On and off since the 1960s, the Alaska Department of Transportation & Public Facilities, in coordination with the Federal Highway Administration and the Municipality of Anchorage (or the lineal predecessors of those entities), have been exploring the concept of a roadway connecting the endpoints of the Seward and Glenn highways. The project is called "Highway to Highway", and the most recent concept for this project is that of a "trenched" freeway through the heart of Anchorage. Highway to Highway was included in the 2005 Long Range Transportation Plan, and would cost at least $575 million (2005 dollars) – by far the largest urban infrastructure project in Alaska's history. Anchorage has a bus system called People Mover, with a central hub in downtown Anchorage and satellite hubs at Dimond Center and Muldoon Mall. The People Mover provides carpool organization services. The public paratransit service known as AnchorRides provides point-to-point accessible transportation services to seniors and those who experience disabilities. An Alaska Railroad locomotive (left) and the Alaska Railroad depot (right) in the Ship Creek valley immediately north of downtown Anchorage. The Port of Anchorage can be seen in the background. The Alaska Railroad offers year-round freight service along the length of its rail system between Seward (the southern terminus of the system), Fairbanks (the northern terminus of the system), and Whittier (a deep water, ice-free port). Daily passenger service is available during summer (May 15 – September 15), but is reduced to one round-trip per week between Anchorage and Fairbanks during the winter. Passenger terminals exist at Talkeetna, Denali National Park, Fairbanks, and several other locations. These communities are also served by bus line from Anchorage. The Ship Creek Shuttle connects downtown with the Ship Creek area, including stops at the Alaska Railroad depot. Anchorage also is currently conducting a feasibility study on a commuter rail and light rail system. For the commuter rail system, Anchorage would use existing Alaska Railroad tracks to provide service to Whittier, Palmer, Seward, Wasilla, and Eagle River. 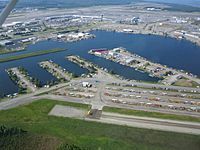 Aerial view of Lake Hood Seaplane Base (foreground) and Ted Stevens Anchorage International Airport (background). UPS Boeing 747 landing at Ted Stevens Anchorage International Airport – a major hub for the airline. The Ted Stevens Anchorage International Airport, 6 miles (9.7 km) south of downtown Anchorage, is the airline hub for the state, served by many national and international airlines, including Seattle-based Alaska Airlines as well as many intrastate airlines and charter air services. The airport is the primary international air freight gateway in the nation. By weight, five percent of the value of all United States international air cargo moved through Anchorage in 2008. Next to Ted Stevens Anchorage International Airport is Lake Hood Seaplane Base, the largest Seaplane Base in the world. Merrill Field, a general aviation airport on the edge of downtown, was the 87th-busiest airport in the nation in 2010. There are also ten smaller private (mostly Department Of Transportation) general aviation airports within the city limits. Anchorage Fire Department engine based at its downtown station, responding to a call early in the morning. The Anchorage Visitor Information Center, located downtown on 4th Avenue. Aerial view of the Port of Anchorage on Cook Inlet in 1999. 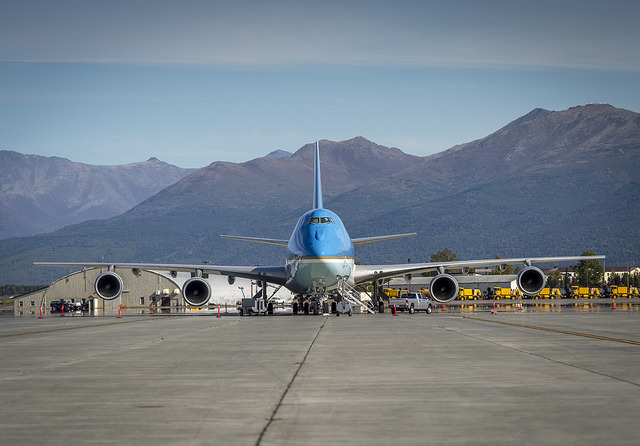 Air Force One on the tarmac at Elmendorf Air Force Base in Anchorage, Alaska in September 2015. View of downtown Anchorage from the restaurant inside the Hotel Captain Cook. The gold building on the right is the Conoco-Phillips Building. It is the tallest building in Alaska and exemplifies the importance of the petroleum industry in the state. Anchorage Community Hospital as it appeared in August 1972. The building is currently called the Arne Beltz Building and houses the municipal health department. KTUU news van parked at Town Square Park. Anchorage, Alaska Facts for Kids. Kiddle Encyclopedia.